Review by AllTheBestFights.com: 2016-04-09, fight not particularly exciting between Gilberto Ramirez and Arthur Abraham: it gets two stars. The Wbo super-Mw champion Arthur Abraham entered this fight with a professional record of 44-4-0 (29 knockouts) and he is ranked as the No.1 super middleweight in the world. He suffered his last defeat in 2013 when he faced Robert Stieglitz in their second bout (=Abraham vs Stieglitz 2), since then he has won eight consecutive fights taking revenge on Stieglitz in 2014 (=Stieglitz vs Abraham 3) and in 2015 (=Abraham vs Stieglitz 4) and beating Martin Murray in his last bout (=Abraham vs Murray). His opponent, the undefeated 24-year-old Gilberto Ramirez Sanchez (12 years younger than Abraham), has a perfect boxing record of 33-0-0 (24 knockouts) and he entered as the No.10 in the same weight class. ‘Zurdo’ Ramirez fought three times last year winning over Maxim Vlasov (=Ramirez vs Vlasov ), Derek Edwards (=Ramirez vs Edwards) and Gevorg Khatchikian (=Ramirez vs Khatchikian). 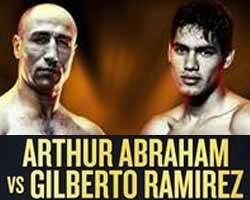 Abraham vs Ramirez is valid for the WBO World super middleweight title (Abraham’s sixth defense); undercard of Manny Pacquiao vs Timothy Bradley 3. Watch the video and rate this fight!